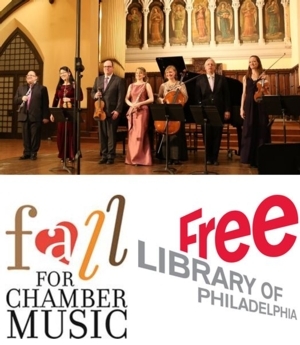 Wed, October 24, 2018 7:00 P.M.
Dolce Suono Ensemble launches “Fall for Chamber Music”, their new 3-year project supported by the William Penn Foundation to engage new audiences in chamber music. They will present performances, coachings, and other interactive events in some of Philadelphia’s favorite civic spaces for community members at all levels of exposure to chamber music. After falling for chamber music, you’ll never be the same! At this FREE event, our dazzling ensemble artists will perform winning works from DSE’s Chamber Music Top Twenty poll. We are announcing the winning pieces in our email newsletters and on their Facebook page, so please follow our countdown and join us at this festive event! The concert will be held in Room 108 at the Parkway Central Library.